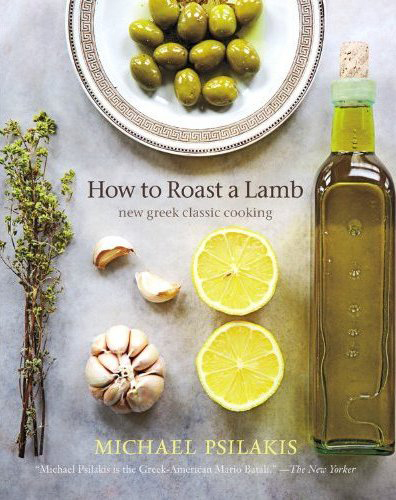 I bought Michael’s Psilakis’ first cookbook “How to roast a lamb” on a whim. I was in a big shopping mall in Athens and the baby was sleeping, so I got into a bookstore and started flicking through cookbooks, a favourite pastime of mine. I was looking around and my eye was immediately drawn to the “effortlessly casual” cover. I had to pick this book up. Of course it is a beautiful book, printed on matt paper(my favourite), with simple but elegant photography, many snippets from Psilakis’ family photo album and really cool stories about his life. I loved the way he writes about himself, so I decided to buy it. I knew about the book of course, but I made a promise to myself years ago not to buy cookbooks from famous chefs, because most of their recipes are so complicated, they are only reserved for special occasions. However, my life’s special occasions usually include more than two people, which means that they are labour intensive by default. I don’t need any extra steps in recipes, endless ingredients or complicated preparations, so I end up never using these “special occasion” recipes. I also cannot cook on the spot things, I need to be able to make them in advance and be relaxed when my guests arrive. But that is just me. Psilakis’ recipes are no exception. Don’t get me wrong here. There are a few simple ones, especially from his family repertoire, but most of the ones that looked exciting to me (because, frankly, lentil soup is not exciting to a Greek person) were quite complicated, with very long ingredient lists and many steps in their preparation. Also, a lot of the ingredients Psilakis uses must be hard to find outside of Greece, which is inevitable when writing about a local cuisine, but he is good at giving alternatives, so no problems there. Psilakis is a very important delegate of Greek food. He has made American people (and the world) pay attention to Greek cooking and has elevated it to the highest level. And I think he has definitely stayed true to his creativity in the book. The way he approaches Greek food is very often so different to what I am used to. On the other hand, it would be nice not to scare people off. Too much. I mean, why is Italian cuisine so famous? Because in people’s minds it is EASY. Fresh ingredients ingeniously tossed together to give a tasty and in many cases gourmet result. Which basically is a lie, but it is a great marketing trick, don’t you think? This is what I would have liked to see in the book, at least partly. But then again, I am in no place to judge Psilakis. Should you buy this book? YES! YES! YES! Why? Because it is a good book. It will give you a successful insight to the prevalent flavours of Greek cooking. It has many interesting recipes. Cool stories. And it is written by someone who loves Greek food and wants to pass his love to the reader. Ok, it is not a book for the novice cook. Or for your everyday meals, although I am sure you might find many ideas for them. But there are somany books out there for those, you don’t need another one! Good review Ioanna and yes, many of the recipes are involved but there’s lots of inspiration in the book. I love love love this book. I bought it a while ago and made several recipes from it (I don’t mind fussy recipes). You’re right about Italian cuisine being presented as more easy and approachable and the same should be done with Greek. Psilakis’s restaurants in New York and Miami are among the best representatives of Greek cuisine in the US right now. I’ve heard good things about this book although it IS complicated. I’m thinking of buying it and working my way through it after I finish cooking through Michael Symon’s book! I’m glad to know it got your vote of confidence.